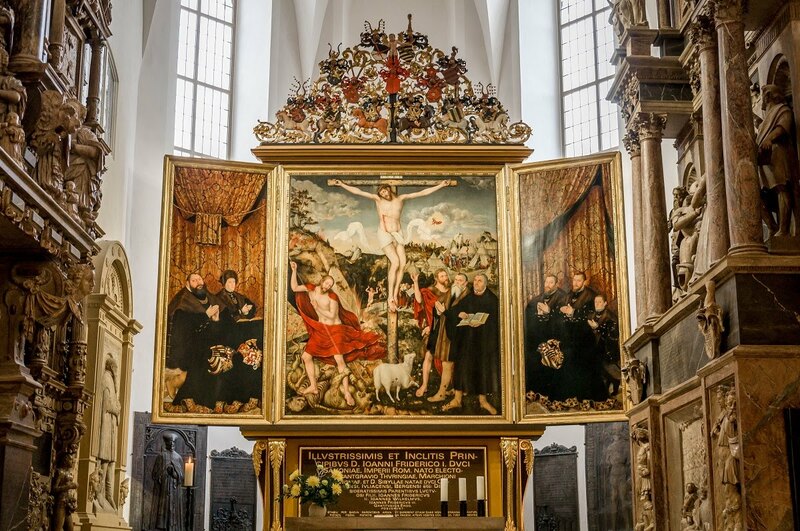 Scapegoat Studio Blog: Did Luther Stifle Lutheran Art? Did Luther Stifle Lutheran Art? For Lutherans who have a high regard for the arts, I’ve found that Lucas Cranach is also usually held in high esteem. I noticed this at the Luther exhibit in the Minneapolis Institute of Art, which I was able to attend in December. Works by Cranach, including many portraits of Luther and other Reformation personalities, are among the highlights of the exhibit. Tour guides took special care to give lengthy explanations for his larger works. Among pastors and theologians, Cranach’s paintings embodying Lutheran theology (e.g. The Law and the Gospel) are held up as an ideal, it would seem, for the creation of contemporary works of liturgical art. My reaction is usually conflicted. As a Lutheran, I'm happy for any praise Cranach receives. As an artist, I wish he had left us a body of work worthy of emulation. To clarify my intentions, I don’t want to short Cranach for any of the credit that is due him. The Lord in his wisdom called Cranach to be an artist for the church in that particular place and time. And the task set before him was herculean—to create a Lutheran artistic tradition virtually from scratch. Meanwhile, the followers of Karlstadt, Zwingli, and Calvin were condemning and destroying it. Even Luther was not wholly supportive of the arts in his early years, warming up to them only after seeing the damage done by the iconoclasts. That Cranach created any kind of an artistic legacy is nothing short of a miracle. Unfortunately, that goal of creating a new artistic tradition went unfulfilled. The equally gifted Cranach the Younger carried on his father’s work, creating the Weimar altarpiece and a handful of other familiar works. And though Cranach the Elder and Younger both were successful enough to employ workshops of artists, they left no successors. 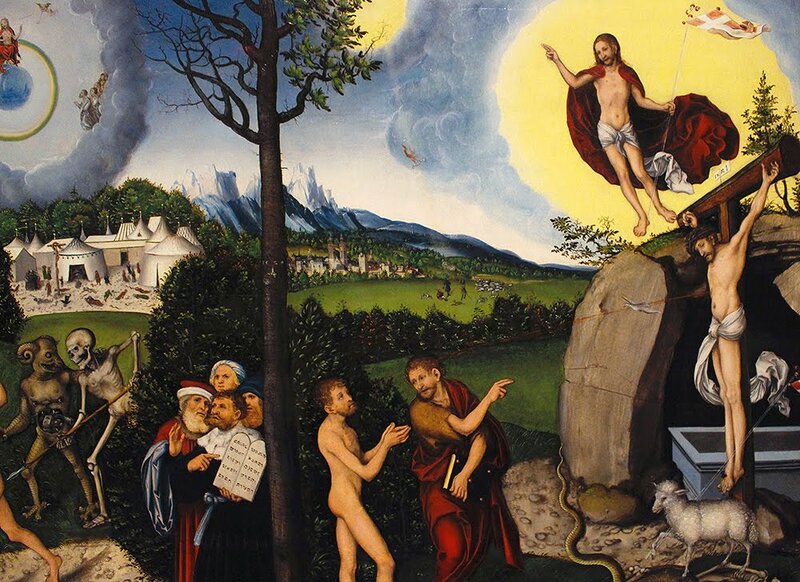 After Cranach the Younger’s death, no other Lutheran artist would leave his mark on history. This is where the argument struck home with me. I have never understood the rapture of a Lutheran pastor explaining a Cranach painting that, to me, was cluttered, uninteresting, and burdened with an abundance of symbolism. When all was said and done, I thought, “Yes, yes, I get it. But why did it take so long to get to the point?” It isn’t that I’m bored with the theology. I actually quite enjoy it. But if you try to force a work of art to perform the role of catechism, you’ll get something that is not very effective as either. I don't suppose the issue is a simple matter of looking at it through modern eyes that are accustomed to immediacy and high impact. It’s true that the part of me that was trained as an illustrator follows the K.I.S.S. rule religiously: Keep It Simple, Stupid. It’s better to paint one truth boldly and confidently than a dozen that compete for attention. Sure, medieval Europeans had longer attention spans than the average American today. 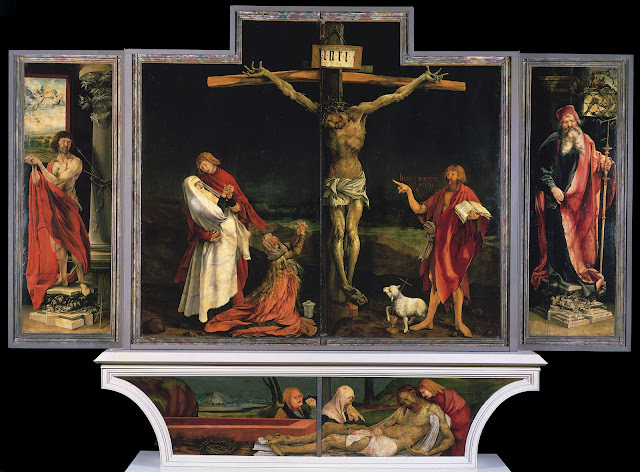 But even compared to those of his contemporaries, Cranach’s altarpieces don’t measure up. None of his panels can hold a candle to the power and presence of Van Eyck’s Ghent Altarpiece, or Grünewald’s Isenheim Altarpiece (see below). If works of art are sermons, then Grünewald gives us a ten-minute sermon that knocks us out of a daze and demands our thoughts for the rest of the day. Cranach gives us a dryly-delivered, hour-long sermon, which garners enthusiastic nods from a few theologians and puts the laymen to sleep. And while I admit to having amused myself a little too much with that comparison, the fact that we often compare church art to “visual sermons” is perhaps in itself misleading. It’s a sermon only in the sense that it should tell us something true about God; it’s not a sermon in the sense that it needs to set forth all the teachings of scripture. Luther was right to praise music for its ability to expound on scripture, as many of his hymns beautifully exemplify. But while the visual arts may indeed be didactic, they are not didactic in the same way as music that incorporates sung texts. The visual arts are rather poor at explaining abstract theological truths. Their strength is an aesthetic beauty that is recognized almost at once, but that demands contemplation, and maintains a longer-lasting impression. Playing the “blame game” is usually not helpful. But perhaps in this case it may be instructive. Was Cranach so overly enthused about the evangelical theology that he decided to cram all of it into every single painting? People more knowledgeable than I am have said, “Not likely.” The body of Cranach’s work suggests that he knew a thing or two about design and composition. I imagine that making a painting for Luther was a bit like making concept art for Star Wars. Maybe Cranach wanted to follow his instincts, but that would have been like telling George Lucas that you think an alien with floppy pink ears and eye stalks who talks like a racial stereotype is a terrible idea. (Good luck with that!) It would have taken an artist of tremendous talent and stature to push back against Luther. So am I blaming Luther for the decline of art in the Lutheran church? Yes, maybe a little. It’s at least plausible, and at most likely, that Luther’s penchant for sermonizing had unintended consequences on the visual arts. I don’t think it’s a stretch to say that the pieces Cranach came up with on his own were artistically superior (if theologically deficient) to those made after Luther came into the picture. Cranach was a good artist. Although not a genius, his expertise with design ought to have been sought and heeded. I’m not saying that if Luther hadn’t been so restrictive, we might have had a flourishing artistic tradition. 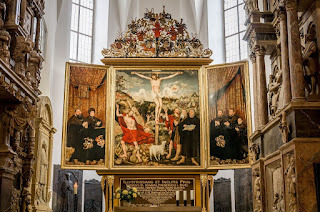 But I do think the evidence points to Luther having more to do with Cranach’s work than he ought to have, and the result was that Cranach’s altarpieces were famous only because Luther commended them, and not because of any outstanding artistic merit. But in any case, Cranach’s ecclesiastical art did not inspire any great imitators or successors. While other factors were probably at play, the fact remains that nothing resembling a visual tradition was ever established in the Lutheran church. Artists should have a solid understanding of theology, symbolism, and the Western tradition. Artists, pastors, and laymen need to see liturgical art as a collaborative process and trust in the other’s vocational duties. In a way, we all face the same herculean task that Cranach did in the 16th century—that of creating a Lutheran artistic tradition virtually from scratch. The difference is that we are without excuse. We don't have Luther looking over our shoulders. We don't have wars ravaging our homeland. The Roman church isn't trying to kill us, and no one is going to start a riot if we erect a statue of Christ in a church. Let's take opportunity of these blessings and work while it is day!